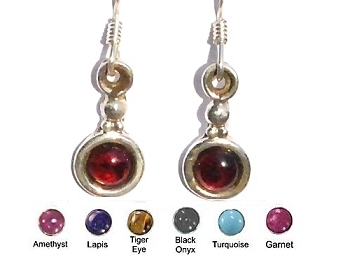 Sterling Silver 925 Hand-made Genuine Stones Dangle Earrings - Amethyst, Lapis, Black Onyx, tiger Eye, Garnet, Malachite or Turquoise. The dangle measures about 1 1/4 inches from the top of the ear wire to the bottom of the earring. An earring pair weighs 1.8 grams. Orders will be packed in the assorted stones Amethyst, Lapis, Black Onyx, tiger Eye, Garnet, Malachite or Turquoise. Enter the requested stones in the free form text above or at checkout. We will do our best to meet your request. The earring display pad in the picture is not included. Earrings are sold by the pair. All sterling is stamped 925 to assure Silver Content.All measurements are approximate.